Mary Green looks at the traditional wildlife of midsummer. June is midsummer, so a good time to review the year so far. It has been a strange year for wildlife because of the weather. It has been unusually dry and very sunny, with average temperatures. However, these temperatures hide some warm spells and unusually cold spells, and generally cool nights. The result has been that plants have been consistently late in coming into leaf and flowering, and the insects and birds fairly late too. I saw a little may blossom out on May Day, but most was much later, and I saw the first moon daisy out (good old M42 Hopwood roundabout) on the same day. The first swallow came about the same time, which was quite late (though you never know if you’ve just missed them), and I heard the chiff-chaff at Easter. Ducklings appeared at the end of April, and the first goslings in early May, watched by a greedy-looking heron. The oak and the ash came into leaf more or less together, meaning that the traditional weather lore is undecided about whether we have a wet summer! Ash is much more influenced by light and oak by warmth, and I think the ash was a little early this year because of the sunshine, and oak late because of the cold nights. I have been looking at the new banks at Alvechurch station, which were seeded by Network Rail’s contractor. They are odd! First of all the dry weather has made them very sparsely covered. There is a mixture of grass and wild flowers. Some of the latter are just normal wild plants from the original patch, some are seeded. They include camomile, which flowered unusually early in the sun, spurge, and some beautiful fumitory. Fumitory is a smoky-leaved red-flowered plant whose name means fire plant, and it grows on arable land and waste ground. But there are also some rather peculiar plants which aren’t British wildflowers at all. These include garden marigolds and some sort of garden campanulas. I’m afraid that happens with so-called wild flower mixes. I’ll be keeping my eye on them. So far the plants look like arable weeds – those that grow on disturbed soil – so they may not survive well in grass. June has the Summer Solstice on June 21 and traditional Midsummer on June 24. This was a time for bonfires (still lit in Ireland) and processions with flowers. The plants especially associated with midsummer include St John’s wort: the festival was Christianised as St John’s Day. This plant is still much used in herbal medicine, and was particularly used for healing wounds and for depression. It grows profusely in some places, liking both meadows and patches of open ground: there used to be some on Alvechurch Station but it may have gone. Another symbolic flower was the orpine, a type of sedum, which has big succulent flowers which used to be called midsummer men. June is also the time of St Barnabas, whose festival was associated with sweet woodruff, roses and lavender, of well-dressing with flowers, and nowadays of rock festivals and so-called druid celebrations. But for most of us, the wild flowers we most associate with June are roses, poppies and elderflower. Our wild roses are plentiful but short lived, growing in woodland where they can climb through the tree cover to the light, and on hedgerows. There are several kinds. The common ones here are the pink dog rose and the white field rose, though you might find a sweetbriar. If you travel north you’ll see the dark pink downy rose, and by the sea the little white burnet rose. All our garden roses were bred from these and similar wild roses from other countries, and foreign rose gardens were well established here by the Middle Ages. Some garden varieties escape into the wild and grow happily. Roses have huge symbolism. The rose is the flower of England, and of course the red and white roses stand for Lancashire and Yorkshire. It is the symbol of love and optimism – rose-tinted spectacles for those promised a rose garden, and so on. Of course, in their wild state their short life adds to their charm, and maybe to their symbolism! They are loved by insects and the berries by birds – and by humans in times of need for their Vitamin C content. The poppy is very different. It is a flower of cultivated land, and has grown wherever people have tilled the earth for grain crops. It doesn’t grow in permanent pasture or under trees. It used to be cut with the corn and always popped up again the next year. For this reason, and because it’s the colour of blood, it became associated with death and life. Cutting it was thought to provoke thunderstorms. Its similarity to opium poppies also meant it was associated with sleep and dreams. Even in earlier centuries it was associated with soldiers (red-coats) and of course its regrowth on the barren fields of Flanders during the First World War gave it a new association with war and remembrance. 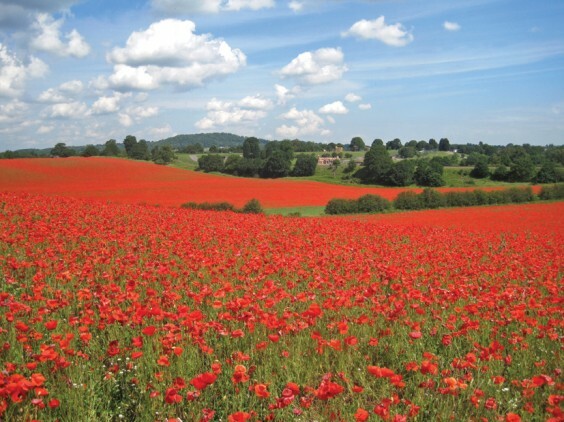 Despite all this, we lost most of our poppy fields during and after the Second World War through intensive agriculture. But the seeds can lie dormant for years and then sprout back when land is cleared and not weedkilled or artificially fertilised. During the 1990s the policy of “set-aside” led to some land being left dormant, and the poppy came back. However, it won’t survive in grassland, and needs to be on cultivated land. The best local example is the fields near Bewdley (above) which the Worcestershire Wildlife Trust has restored to old grain-farming methods, leading to swathes of red. Poppies grow alongside other summer flowers of cultivated land: camomile, wild radish and the beautiful corn cockle, cornflower and corn marigold. Most of these are now rare in the wild. They are often included in wild flower seed mixes, but are rarely suitable for domestic gardens or for permanent meadows. They need the pattern of cultivation without chemicals. The third plant which to me says “June” is the elder, also known as the boon tree. It is in the honeysuckle family, and has a gorgeous scent. It is used for making fritters, wine and cordial and cooking with gooseberries, and the berries for wine, relishes and jams. Insects love the blossoms and birds the fruit. It is very common, growing quickly everywhere. At one time elder hedges were hugely prized as the “fruits and berries bear a price at market” and the wood was good to carve. The flowers were also used as eye-lotion and skin cleanser. But it had a darker side. It was said to be the tree that Judas hanged himself on, and even to be the tree of Christ’s cross. The fungus that grows on it in autumn was called “Judas’s ear”. It was powerfully magic, keeping the Devil away and charming warts. It was bad luck to burn it. The unpleasant smelling leaves were used as a fly-deterrent, often being put on horses’ harness. Horse whips were made from elder too. Nowadays we tend to underrate it, except when it fills the hedges with bloom after the hawthorn has gone over. Honeysuckle itself, of course, also flowers in June. It climbs through trees like the rose does, so can grow in hedges and woodland. It’s the perfect nectar plant, and like the rose epitomises the sweetness of summer. And hay meadows like Eades Meadow are at their best in June, as well as the arable land where poppies might still grow. I only wish we could hear the cuckoo calling over the fields and hedges round here. I have had reason lately to be grateful to my neighbours, and found this poem from a few years ago, which carries my thanks. Love thy neighbour, said the vicar. On the next farm, what, all of them? He meant other people, the human race. That way the world will survive.